This 3-day workshop is designed to introduce the participant/bodyworker to the different concepts Fasciatherapy MDB has developed around the theme of ‘Movement’. 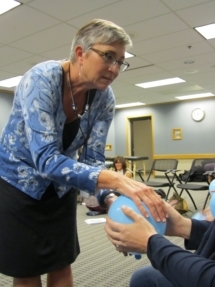 In addition to the different forms of movement, gestural and manual techniques and the categorization of these, the relevant anatomy is presented in practical detail and the perceptual and manual competences are developed in guided hands-on protocols. The concepts will allow the participants to differentiate the various concepts and principles of movement in their practise and apply the analytical, gestural and manual techniques specific to Fasciatherapy MDB. The manual techniques presented are utilized to liberate articular blockages manually in the joints with the ‘analytic manual approach to the micro motility of the joints’. There will be time assigned for discussion on how to integrate the new principles and techniques learned into participants existing practice and how these may aid the personal development of the practitioner. Fascia is an umbrella term for different types of connective tissue. It is also a dynamic sensory organ that envelops, connects, subdivides and ultimately penetrates all anatomical elements of our body. The importance of fascia has long been overlooked in the past and it is really an environment which acts as a sensory organ, it is in fact the fascia through which we experience our life, our being. Over the last decades, research from both regular and complementary medicine have begun to uncover how complex the importance of this tissue is for psychosomatic and physiological health. Fasciatherapy is a manual and gestural therapy, founded deeply on the developments of the great osteopaths in history, it is in fact a form of osteopathy with an holistic approach which was developed by the French osteopath Prof. Danis Bois. His lifework created a form of manual therapy that reaches the being of a person on a profound somatic level through a specific mode of touch. The relationship of the client to her/his own perception is developed as the fascia releases and optimizes its tone into structural balance. As the tissue balances also the perceptual properties of this fascial environment are optimized, meaning the person becomes more present to their own experience of life. A sense of solidity of self can now nourish personal autonomy and enrich all actions and competences. This benefits the wellbeing and deepens the experience of relating in social contexts. The person experiences improved health and personal, social, emotional and psychological wellbeing. In case of somatic or psycho-somatic imbalances Fasciatherapy MDB mobilizes both the organic and psychological vital resources. During treatment the fasciatherapist addresses the tissues and assists the self-regulating forces slowly and respectfully, without manipulating. It is a very gentle yet profound technique. In Fasciatherapy MDB we have developed three major methods, we work with a specialized form of touch, sensorial introspection/meditation and a special protocol of movement, which enters deeply into the perceptual and muscular-motor habits of the client.